Snow Tea is a herb used by the Ancient Royal family in China. It can reduce dark spots, dark eye circles and swells. It can also soothe and provide nutrients, moisture and anti-oxidants to the skin. 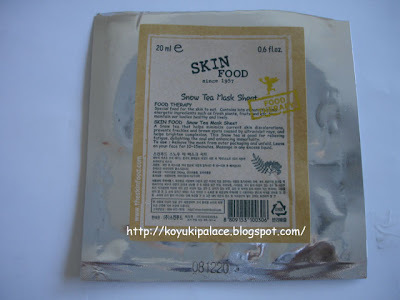 The Skinfood Snow Tea Sheet Mask contains snow tea, herbs, cucumber extracts, water, Vitamins a, B1, B2, C. It brings softness and reduces yellowness on your skin, making it look radiant.